Most people grab a Bloody Mary to help ease a hangover, to sip alongside brunchy Benedcits, or simply to get a dose of vitamins while cocktailing (thanks, tomato juice!). Some are in it just for the garnishes—that celery stalk might be the most green they get all week. But when Bloody Mary accoutrements get extreme, going way beyond the olives and spiced green beans, they become a veritable meal unto itself. This fact wasn’t lost on chef Isais Pena at Spare Tire Kitchen & Tavern in the Miracle Mile. 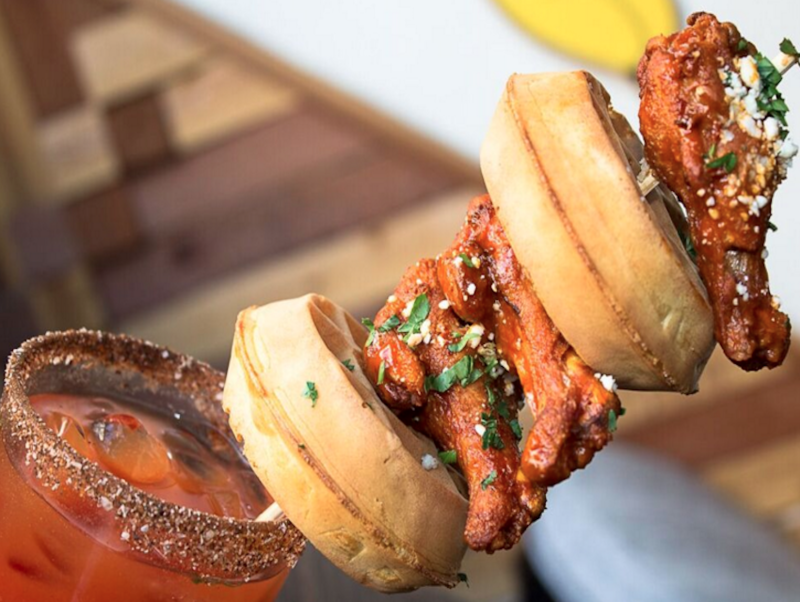 In addition to the gastropub’s full weekend brunch menu with typical waffle-omelet-French toast fare, he created a section of Bloody Mary “snacks.” Let’s just say the “snacks” should get top billing over the Bloody Mary. Who needs to order a burger when your cocktail comes its own skewered slider, onion rings, or pickle? One comes topped with mini waffles and sauced Buffalo chicken wings with blue cheese crumbles. Another, the Surf & Turf, features two jumbo shrimp and chunks of grilled hangar steak. The grilled cheese with bacon and smoked cheddar seems to be a natural fit—a Bloody Mary is as close to tomato soup that you can get in cocktail form. An after-school special for grown-ups. Once you get to the actual Bloody Mary part, it’s a pretty straightforward one made with housemade mix that has a hint of spice, cilantro and horseradish. The best part is that prices for these whacked-out concoctions still only hover around the $14 mark, which is what a regular cocktail with nothing more than a twist of lemon can cost. So, yeah, bargain. Of course, Spare Tire isn’t the first to go to extreme measures with its Bloody Mary toppings. The Bloody Royale at Franklin & Company in Hollywood’s Franklin Village comes with everything but the kitchen sink: celery, olives, pickles, pickled-wrapped roasted jalapeno, roast Brussels sprouts and one English burger slider. Yes, you have to eat a lot to get to the hooch, but at least you have something in your stomach before boozing it up. In Long Beach, The Attic on Broadway is also well-known for its build-your-own Bloody Marys. Not only can you pick your own spirit, hot sauce and spice for the rim, but the garnish choices range from the basic celery and pickled vegetables to jerky-stuffed olives, shrimp, baby back ribs and pulled pork sliders. But beware: If you’re not careful, your simple brunch cocktail will cost more than brunch for two. Drink, er, eat at your own risk.